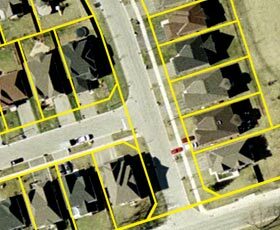 The First Base Solutions® MapWarehouse contains a variety of high quality mapping products, some of which are produced and owned by First Base Solutions® as well as others which are made available through relicensing arrangements. First Base Solutions® will continue to expand this mapping coverage and content. This site has been designed to allow users to readily identify and view their area of interest and then download and purchase mapping data. 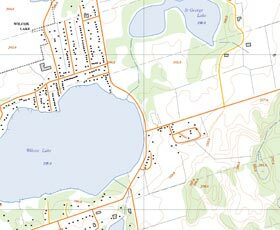 Ontario Base Mapping is topographic mapping created and maintained by the Ontario Ministry of Natural Resources. The mapping was produced at a scale of 1:10,000 for Southern Ontario and 1:20,000 for Northern Ontario. An orthophoto map is an aerial image that has undergone a process of "orthorectification" to correct for the effects of camera lens tip and tilt, image scale variations and object displacement due to ground relief. 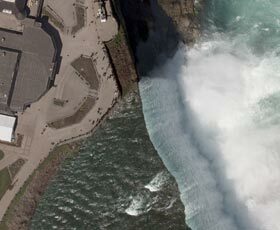 The orthophotos are seamlessly joined together, regenerated at any scale and enhanced in terms of colour and contrast, giving the user the positional accuracy of a map, plus the detailed visual information inherent in a photograph. The mapping has been divided into "tiles" and is provided in a compressed MrSID and ECW format. Is a compilation of ownership parcel data with an accuracy dependent on the build procedures used. Generally the Ontario Parcel Mapping is a good fit with the digital orthophoto mapping however this mapping is Not a Plan of Survey. The mapping has been divided into "tiles" and is provided in DWG format with the property identifier (PIN) as a text element. DWG or SHP files can be ordered for specific parcels by Custom Order. Is a representation of a topographical surface, specifically a regular grid of spot heights and breaklines (noticeable changes in slope). The DEM has been divided into "tiles" and is provided in DWG format with 3D polylines. Is a geographically referenced topographic raster (image) map and is provided on a map sheet basis in Geo Tiff format. Line mapping (vector mapping) consists of 33 layers of topographic data and is provided on a map sheet basis in ArcExport, DWG, DXF & SHP format. Of OBM can be provided in digital format (PDF - not georeferenced) or colour hard copy format on 24" x 30" 24lb Bond. Digital prints can be downloaded directly and hard copy prints are mailed the following business day.